Summary: Allergy-Friendly Food for Families is the most trustworthy, comprehensive, practical, and kid-friendly collection of recipes that exists for the important and growing audience of allergy-aware families. Unlike other allergy cookbooks, this book covers not one or two allergens, but the five most common allergens in kids: wheat, dairy, eggs, nuts, and soy. Each of the 120 recipes is free of at least three of these allergens; most are free of all five. When parents are desperate for ideas for what to make for dinner (or lunch, or snack time), they want recipes from someone they trust, for food that tastes good, that doesn't require a lot of fancy ingredients, and that the whole family can eat. Allergy-Friendly Food for Families is the ultimate resource. From the three crucial mealtimes (breakfast, lunch, dinner) to the "fun" foods families can't live without (desserts, snacks, parties), parents are completely covered. Perhaps most importantly, all of these recipes are simple for parents to make. I guess I'm devoting this weekend's posts to food allergies! Not only did I review two terrific picture books about peanut allergies yesterday, but today I'm reviewing the cookbook ALLERGY-FRIENDLY FOOD FOR FAMILIES: 120 GLUTEN-FREE, DAIRY-FREE, NUT-FREE, EGG-FREE, AND SOY-FREE RECIPES EVERYONE WILL LOVE from the editors of Kiwi. This cookbook is a must-have for families who are dealing with food allergies! ALLERGY-FRIENDLY FOOD FOR FAMILIES includes recipes that omit some of the most common food allergens -- gluten, dairy, nut, egg, and soy. Fortunately for us, we don't have to worry about gluten or the soy allergies; however, I found plenty of dairy, egg and nut free recipes that I wanted to try! The cookbook is gorgeous with lots of color photographs, and it also has lots of tips to get your children involved in the cooking process. One of the things that I most enjoyed about this cookbook were the colored tabs on every recipe. These tabs included a list of what allergens are missing from the recipe. For example, the recipe for Buddha Bowls were egg-free, nut-free, diary-free, and gluten-free. These tabs make it quick and easy to tell if the recipe will work for your individual needs. The cookbook has 120 family-friendly recipes but it also has some great educational material about food allergies. The beginning of the cookbook has a section called, "Welcome to the "-free" life", and it teaches about food allergies and the potential reactions. There is also a section with questions called, "Ask the Experts" where doctors answer some common allergy questions. The next sections include the recipes and are divided into the following chapters: Breakfast, Lunch, Dinner, Dessert, Snacks and Parties-- nothing really surprising there. Finally, there is a helpful section that helps you to build a natural, allergy-free pantry. I found quite a few recipes that would work for Booking Son's food allergies. Since he doesn't have a gluten allergy, I tend to stay away from many of these recipes because I don't have the gluten-free substitutes on hand. So I first decided to make Frankenstein Sweet Potatoes -- there is an entire sweet potato section in this cookbook. 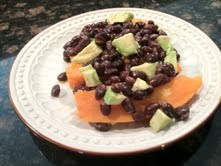 Basically, it's a very simple and healthy recipe that combines sweet potatoes, black beans, avocado, lime juice and salt. Because of the colors, it's actually ideal for the fall and/or Halloween! I initially prepared the recipe as suggested in the cookbook (see picture below), but then decided that I could just cube the remaining sweet potatoes and reheat for a quick side dish. 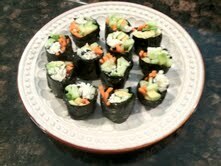 Next I decided to make the Veggie Sushi Bites. Booking Son has been asking for sushi for some time now, and I'm always afraid to order it for him because of cross contamination. This recipe uses finely ground cauliflower for the "rice" along with carrots, avocado and cucumbers. It wasn't too hard to make although I do wish I had had a bamboo mat to assist with the rolling. I don't think they turned out too badly considering it was my first attempt at making sushi! Booking Son was thrilled and, while I'm not sure he loved the flavor and/or texture, he did eat one and ask for another. There is a terrific assortment of recipes for all types of dishes, and I have a list of other recipes to try in the near future. Check out these recipes for the Giant Cookie Cake and the Cool Zucchini Noodles and Mighty Marinara Sauce. There are also some interesting and unique dessert treats that kids are certain to love. And last but not least, there is a card in the back of the cookbook for a free subscription to Kiwi Magazine, a premier magazine about raising families the natural and organic way! Overall, I was pleased with ALLERGY-FRIENDLY FOOD FOR FAMILIES and definitely recommend it to families who are dealing with a variety of food allergies. We have no food allergy issues in our house, but I have many friends that do! I'm going to definitely recommend this one to them. It's so nice to see that they're writing cookbooks for those with allergies these days. Your sushi is adorable!! I can't believe you made that sushi - very impressive! I would have been too intimidated! Your dishes look yummy! 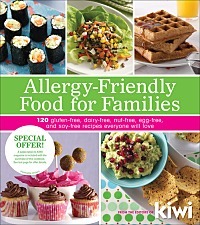 How great to have such resources to help navigate moms who need to cook when allergies are prevalent in their families. I'm so impressed with your sushi! Glad Booking Son ate two!